The Three Men are 18th century additions to a Neolithic oval barrow, the outer rim still quite visible. This is the only burial found within the Meg's Walls enclosure. 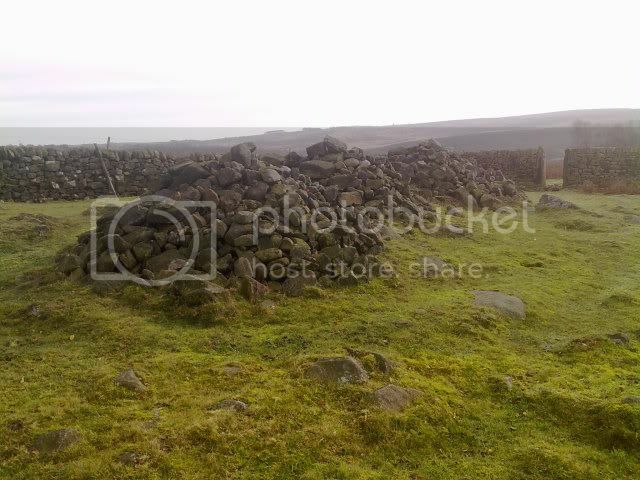 The 3 cairns are said to commemorate 3 shepherds who died on the moor or, and the more believable story, 3 drunken priests returning from a funeral. A little further on you'll pass through a second set of stone gate posts, if you're on the right track the Three Men will be before you as you go through them, as seen in the photograph below.